If our sorrow is to be lessened by anything, it may be remembering the joy of loving and being loved by him. 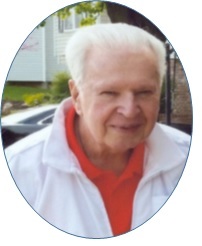 Carl Macios, 83, of Granite City, Illinois, died Saturday, March 24, 2018. He was born March 24, 1935, in Granite City, to Stanley and Bertha, nee Calvin, Macios. He married JoAnn M., nee Margulen, Macios on Aug. 27, 1955, at Sacred Heart Church in Granite City. Mr. Macios was a member of St. Elizabeth Church; a U.S. Coast Guard veteran, employed with McDonnell Douglas and Boeing for 35 years, and was a Nameoki Township Tax Assessor for 35 years. He served as a member of the Granite City School Board for 10 years, including two years as president, and was a devoted local sports fan, especially golf and basketball. He was preceded in death by his wife; parents; a daughter, Cathy Heth; and a great-granddaughter, Macie Crow. Surviving are his children, Carla (Tony) Crow of Glen Carbon, IL, JoElaine (Russell) Knight of Collinsville, IL, Marc (Christine) Macios of Collinsville, IL., JoAnn (Rafael) Ruiz of St. Jacob, IL, and Julie (Phil) Morris of Glen Carbon, IL; a brother, Ted (Norma) Macios of Granite City, IL; 10 grandchildren; and 12 great-grandchildren. Memorials may be made to Shriners' Hospital for Children. Visitation: Friends may visit from 4 to 8 p.m. Wednesday, March 28, 2018, at Thomas Saksa Funeral Home, Granite City. Funeral: Service will be held at 10 a.m. Thursday, March 29, 2018, at the funeral home. Burial will be in Calvary Cemetery, Edwardsville.